Only 1d 19h 57m 21s left! 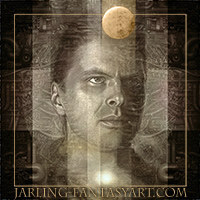 Short Bio: Fantasy Artist Uwe Jarling was born in 1968. After graduating with a diploma degree in graphic design 1991 he worked as a illustrator and graphic designer further on. His first works were countless covers for videos, books, ... and many technical and architectural illustrations for advertising agencies. An important step in his further development followed in 2000 where he started to develop his "Fantasy Artwork" more seriously and did his first attempts creating his art on a computer. Since 2003 almost all of his work is painted digitally for clients all over the world mainly in the Fantasy Art genre. Uwe lives and works in a little village in the south of Germany. Tools used: Fantasy Artist Uwe Jarling is a traditional artist using traditional media like oils, watercolors and mainly gouache, but the last years he did the step into creating his art digital. The last 3 years 98% of his images are created using digital tools. Uwe experimented with several digital tools 3d as well as 2d. For 3d he experimented with 3d max, Poser, Vue, Bryce and more nice 3d applications, but as it doesn�t fit him too well he decided to work mainly using 2d digital tools. For his 2d digital images Uwe uses mainly the software Painter, currently version 9, so most of his paintings are now done with Painter. For color corrections of his images or several effects Uwe uses Photoshop. All his latest images are done using Painter 9 and some Painter 9 and Photoshop CS in combination. Uwe currently �paints� on a Macintosh G5 using a pressure sensitive Wacom tablet.